The Kinemastik International Short Festival will be held at Herbert Ganado gardens next weekend. As the season’s theatre and music festivals came to a close last week, films are in the spotlight at the Kinemastik International Short Film Festival. Ramona Depares finds that this year’s event merges music and visual art with movies into one seamless experience. 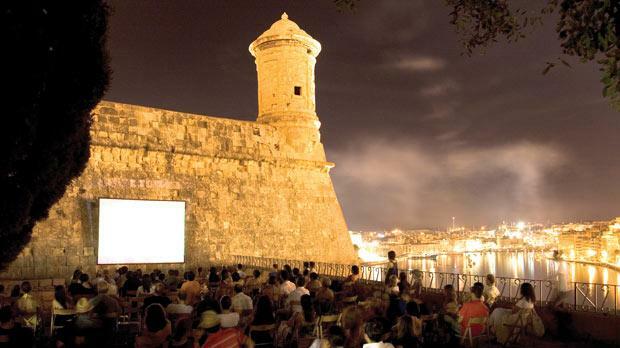 For the past eight years, film buffs have been gathering in Herbert Ganado Gardens, Floriana, to enjoy a bonanza of some of the top European short film offerings. This year, the festival is back with the expected crop of cult and up-and-coming directors, but there is more. To complement the two nights of film, Kinemastik is also showing a joint art exhibition, Horse Latitudes. The exhibition, which runs at the subway underpass near the Porte des Bombes gate in Floriana until Sunday, includes works by British photographer and Deejay Ali Tollervey and the Bare Bones multi-disciplinary collective. Tollervey’s photographic work from his ongoing project with British band Dark Horses will strike a chord particularly with those who attended the band’s performance for the festival kick-off party last Saturday. The input of Bare Bones, a London-based group of artists and writers that self-publish a newspaper that is distributed for free in London and Paris, should also prove interesting. On the nights of the film screenings (Saturday and next Sunday), the Bare Bones’s artwork will be available for purchase on the night, as will posters from previous editions of the festival illustrated by Maltese artist Chris Bianchi. Kinemastik this year is also hosting a series of film-related workshops, master classes and talks. British film director Wiz – who most notably worked on music videos for artists like David Bowie, Marilyn Manson, Massive Attack, Oasis, Chemical Brothers, Kasabian, Arctic Monkeys and Dizzee Rascal – will lead a workshop at the British Legion, Melita Street, Valletta, on Thursday between 3 and 5 p.m. The director’s work will be screened on Tuesday and Wednesday at 7.30 p.m. The screenings will be followed by a Q and A session. American film-maker, artist and head of the Bare Bones collective Matt Lambert will be giving a separate master class on Friday, also at the British Legion at 7.30 p.m.
Lambert is a well-known contributor to various art, design and film festivals. The event will include the screening of the film-maker’s work and a Q and A session. The festival also seeks to attract younger potential film-makers with a three-day workshop given by festival producer and arts curator Carla MacKinnon that is aimed specifically at teenagers aged between 13 and 17. The course is designed to provide a detailed, practical guide to producing a short documentary from development to production. The idea is to offer participants a platform for their work, through local screenings. The workshop will be held at St James Cavalier, Valletta, between Wednesday and Friday. The course is free but spaces are limited so early bookings via e-mail kinemastikworkshop@gmail.com are encouraged. Even younger film buffs have a place in this year’s Kinemastik, with a Children’s Film Festival being held next Sunday between 8.30 and 9.15 p.m., also at the Herbert Ganado Gardens. The selection of films and animations has been carefully curated to feature a colourful array of characters (including a pink meteorite, a lonely bear, a wet skateboarder and John Lennon) that will pique the interest of children. The festival culminates next weekend with the open-air screening of a selection of short films, covering a wide variety of genres and styles. The entries will be competing for the Jury’s Prize, the Kinemastik Golden Dot. This year’s jury is made up of directors Wiz, Carla MacKinnon, Matt Lambert and Maltese film-maker Kenneth Scicluna. The public will also be given the opportunity to vote for their favourite film. This year’s selection includes the eagerly awaited and locally produced Tele-Monkey, Malta’s first Stereoscopic-3D animated short by Martin Bonnici. Other Maltese entries on the programme are Roxanne Gatt’s Maltese Housewife and Axis Bomb and Duncan Bone’s, Harry Malt’s and Emma Mattei’s Bus Terminus. Also high on the list of must-sees are Kiwi producer Sam Kelly’s Lambs, which follows the story of a young drug dealer who is being abused at home; winner of Best Action at the New York Film Festival Chalk, by Martina Amati; winner of the Documentary Prize at the New Horizons Film Festival Il Capo, by Yuri Ankarani; Sundance success Tumult, by Johnny Barrington, and Mohammadreza Farzad’s acclaimed Blames and Flames, among others. The Kinemastik International Short Film Festival is supported by the Malta Arts Fund, the Malta Film Commission and St James Cavalier Centre for Creativity.